Good Friday afternoon! Our forecast is looking great as we move into our weekend plans, as highs reach the lower to middle 70s this weekend. Saturday is the 1st day of December, but it won’t feel much like December as ridging takes over the southeast. A ridge is associated with warm air, and that’s just what we’ll notice through early next week before some minor changes are expected. If you have plans outdoors this evening, expect a fast drop in temperatures. While it won’t get near as cold as recent nights, temperatures will still manage to get chilly after dark. Look for a temperature near 56 by 7 pm and 46 at midnight. Skies will remain partly cloudy to mostly clear through the night. Saturday is looking like a fantastic weather day, as highs warm into the lower 70s across all of west and central Alabama. Skies will remain partly cloudy through the weekend due to a warm and moist flow off the Gulf. Winds will increase to 10mph out of the south tomorrow afternoon. As moisture levels increase, we’ll notice a few extra clouds here and there. The West Alabama Christmas Parade kicks off Monday evening in Tuscaloosa. If you’re going to the big parade, look for dry and comfortable conditions. Temperatures will fall into the 60s after sunset or around parade time. We’ll be watching an upper air trough progress east on Monday and Tuesday. The trough will get close enough to Alabama to send a cold front south late Tuesday and early Wednesday. We’ll notice a band of showers and storms develop along and ahead of the front Tuesday evening. There is little to no surface based instability forecasted with the front, so I don’t expect any severe weather issues. Rain totals will reach 0.50″ in some spots across west and central Alabama. Highs will reach the lower to middle 70s on Monday and Tuesday, but we can expect a nice drop in temperatures on Wednesday. Temperatures will fall into the lower 60s for highs on Wednesday and upper 30s for lows by Wednesday night. Good Thursday afternoon to you! After a cold start to the day, temperatures made a nice warming trend this afternoon. Most spots warmed into the lower or middle 60s for highs today. The upper air trough is moving out, and ridging is moving in from the west. This is allowing for a warming trend to take over the southeast. Also, a developing south wind on the west side of a surface high will warm conditions in our area. A south wind will not only warm the air temperature, it will also increase low level moisture. It won’t get as cold tonight, but conditions will get fairly chilly late. Look for lows to reach the upper 30s late tonight. There could be some scattered fog in spots, so use caution when traveling tonight or early tomorrow morning. As a south wind takes over on Friday, warm and moist air advection will allow a few clouds to develop. Skies will become partly sunny at times on Friday, Saturday and Sunday. I don’t expect any rain through the weekend and start off next week. There area lots of big events happening in west Alabama this weekend and early next week. First, Christmas on the River in Demopolis started lastnight. There are no weather issues expected through Sunday… the day the event ends. Highs will reach the upper 60s on Friday and lower to middle 70s for the weekend in Demopolis. Lows will fall into the 40s or 50s at night. A light jacket will be needed at night through the weekend. There is no risk of rain today through Sunday. A fast moving upper air trough will move into the upper midwest on Monday and Tuesday. The trough will send a cold front into Alabama sometime Tuesday evening or Tuesday night. A band of showers and storms will likely develop ahead of this front and move into Alabama late Tuesday. A few showers will remain possible into Wednesday morning, but it looks like the rain will move out fast. Computer models have warmed the temperatures a tad behind the front, so I’ve bumped up our afternoon highs on Wednesday and Thursday. Highs will top out in the lower 60s on Wednesday and middle 60s on Thursday. Good Wednesday afternoon to you! The weather has turned out very nice this afternoon, with highs near 60 across much of west and central Alabama. If you like the warmer weather, you’ll really like the forecast as we move into the weekend. That being said, we have one more very cold night to go before the nice warming trend takes over. As the upper air trough moves east of Alabama, ridging will take its place. This means a gradual warming trend through the weekend. As low level moisture increases, you’ll notice a few extra clouds on Friday. Most spots will fall into the upper 20s for lows on this Wednesday night. There’s a chance some scattered freezing fog could develop across west and central Alabama, so use caution when traveling tomorrow morning. We had lots of reports of freezing fog over east Mississippi early this morning, but temperatures stayed just warm enough in Alabama to prevent issues. Any local issues tonight should be very minor, but it’s worth keeping an eye on. Some of the typical colder spots in north Alabama may reach the lower to middle 20s. Look for a nice warm-up tomorrow afternoon, with a high near 63 degrees. Areas south of I-20 may reach the middle 60s. Skies will remain sunny on Thursday, but clouds will increase a tad on Friday, as low level moisture moves in out of the south. Highs will reach the upper 60s on Friday, with a partly sunny sky. As upper air heights continue to increase over the weekend, many spots will reach the lower to middle 70s across Alabama. We’ll notice a partly cloudy to partly sunny sky through the weekend. At this point, I don’t see any risk of rain. A sharp upper air trough will move in from the west on Tuesday and Wednesday of next week. We can expect a band of storms ahead of an advancing cold front. Storms will move in sometime Tuesday evening or Tuesday night. Rain will end early Wednesday, with a shot of chilly weather moving in on Wednesday. Good Tuesday evening! We picked up a nice rain event late lastnight and early this morning, as a cold front moved in from the northwest. Rain totals exceeded 1 inch across parts of west Alabama, but many spots picked up around 1/2 an inch. The rain totals generally lessened from west to east across the state. Our weather has turned noticeably colder today, as a cold front moved in from the northwest this morning. A thick deck of clouds behind the cold front, kept skies from clearing out before sunset across much of central Alabama. Skies are clearing out across west Alabama now, but the sun didn’t have time to warm the surface any this afternoon. With a sky going clear tonight, temperatures will be allowed to cool off quickly after sunset. Look for lows in the lower 30s across all of west and central Alabama. A light freeze is possible north of I-20. The upper air trough will quickly push east of Alabama tomorrow and on Thursday. We’ll notice a good supply of sunshine and warmer days. Highs will reach the lower 60s on Wednesday and middle 60s on Thursday. A weak upper air ridge is expected to move into our area from the west by the weekend. The ridge will bring warmer temperatures into Alabama from the west, with highs in the upper 60s on Friday and lower 70s on Saturday. Temperatures continue to modify at night as well, with lower 30s Thursday morning, lower 40s Friday morning, upper 40s Saturday morning and lower 50s over the weekend. With a light south wind, moisture levels will increase on Saturday and Sunday. With warm and moist air advection, skies are expected to become partly sunny on Saturday and Sunday. We may reach the middle 70s on Sunday, depending on the amount of sunshine. Temperaures will remain in the 70s through Tuesday. A cold front will bring weather changes on Tuesday, with the risk of scattered storms late in the day. At this point, it looks like a line of storms will reach west Alabama sometime Tuesday evening or Tuesday night. I don’t see any signs of severe weather. Good Tuesday morning! All of west and central Alabama picked up a nice batch of rain late lastnight and early this morning. Much of west Alabama picked up between 0.50″ and 1.50″. Storm totals were a little lower east of I-65. Rain is still falling over our southern Counties as of 10 am. The lingering rain this morning will continue to move southeast and out of our area. Areas along and north of I-20 are already dry. All of central Alabama will be rain-free by 11 am, as the dry and chilly airmass moves in from the north. Temperatures will stay in the 50s all day, under a cloudy sky. The sun may come out after 2 pm, but I don’t think we see enough sun to offset the cool air advection. 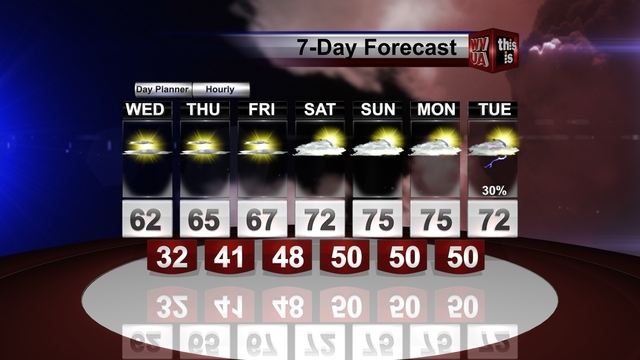 The rest of the week is looking great, with highs back in the lower 60s on Wednesday, under a sunny sky. After a cold start to the day both Wednesday and Thursday morning, look for that quick rebound in temperatures. Highs will reach the middle 60s on Thursday and upper 60s on Friday. The weekend forecast will become much warmer. Highs will reach the lower to middle 70s on Saturday and Sunday. Good Monday evening to you! We’re dealing with spotty, light showers across west Alabama at this 4 O’clock hour. Showers will increase later tonight, as the main upper air support moves in from the west. A weak surface low will move across south Alabama and should help create lift across west and central Alabama. There will be no surface based instability tonight and on Tuesday, so there is no risk of severe weather. The rain that spreads in tonight and early on Tuesday will remain light to moderate. Most spots between now and noon on Tuesday will pick up between 0.25″ and 0.50″. As the lifting mechanism moves out around lunch on Tuesday, the risk of rain will also move out. Dry air is expected to settle into west and central Alabama during the afternoon hours on Tuesday. There’s a chance the sun could peak out from time to time before the official sunset. Highs will reach the lower 60s during the afternoon hours. The forecast pattern will then favor a slow warming trend for the rest of the week and into the weekend. Look for a few cold nights, with lows in the lower 30s Tuesday night and Wednesday night. Skies will become sunny and remain sunny on Wednesday, Thursday and Friday. Look for highs to return into the upper 60s on Friday and lower 70s on Saturday and Sunday. A weak upper air trough will slide north of Alabama on Saturday and Sunday. A cold front is expected to stall north of the state over the weekend. That will allow a warm and moist south flow to develop through the entire weekend. Highs will top out in the lower 70s, with lows in the lower 50s. At this point, I don’t see any risk of rain across the state through the weekend. Good Monday afternoon! 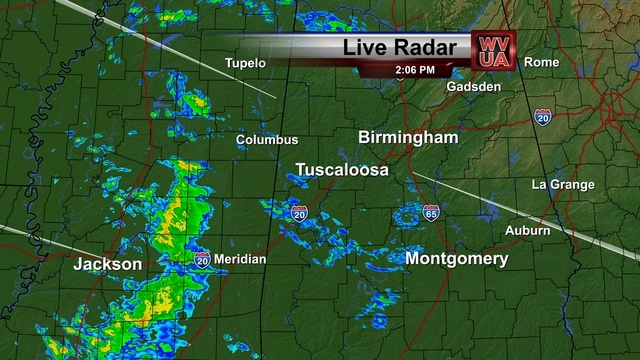 As of 2:06 pm, light showers and sprinkles were developing across parts of west Alabama. These small, light showers are moving east northeast. Notice the heavier batch of rain in east and central Mississippi. That batch is also moving east northeast and will impact west Alabama sometime after 4 pm. This afternoon and evening will feature the risk of scattered, mainly light showers through sunset. The best chance of light rain before sunset will occur in west Alabama, with the moderate showers occurring close to the Alabama/Mississippi State line at times through sunset. If you have an outdoor event planned this afternoon or evening, expect the risk of scattered showers at times. The rain will not be continuous this evening, rather it will be hit or miss. Have the umbrella nearby incase a shower moves over your area. As upper level energy moves in from the west tonight, showers will continue to increase. A few rumbles of thunder are possible tonight and early on Tuesday, but there is no surface based instability present, so severe weather will not occur. Keep the rain gear handy through tonight and into tomorrow afternoon. Showers will gradually spread out of the area and to the east after lunch on Tuesday. I don’t expect a heavy rain event across west or central Alabama, but storm totals may approach 1/2 an inch in spots. We could use the rain, so we’ll take what we can get. Temperatures will cool some behind the front, but nothing like what we just had over the weekend. Temperatures will return into the 30s Tuesday night through Thursday night, with highs in the lower 60s on Tuesday and Wednesday. A nice warm-up is expected in time for your weekend plans.